Well guys, I didn’t win the powerball. ? I didn’t even get one stinkin’ number! I’m not one to play the lottery very often, but I was a little excited because when I got my ticket the first two numbers were my birthday! I thought maybe that was a good sign? 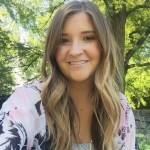 If you made a new year’s resolution to eat healthier or eat more salads today’s post is going to make you very happy! Why? Well, if you’re anything like me, eating a salad everyday can get old. Fast. The key to keeping things interesting to really mix up the textures and flavors so that you never get bored. 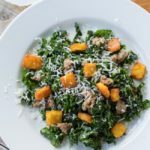 This spiralized butternut squash salad with kale and quinoa is the perfect winter salad, it’s super pretty, and it’s full of flavor! The solution? Utilize winter produce! I know, it seems obvious, but I think a lot of us think crunchy romaine, juicy tomatoes, and sliced cucumbers when we think about salads. Or maybe that’s just me? It’s available (and tasty) all year round. It lasts in the fridge for way longer than lettuce and you can dress it and it doesn’t wilt! It’s a dark leafy green that is full of wonderful nutrition. Butternut squash is another veggie that I eat like it’s going out of style. There’s just so much you can do with it! For this salad I decided to leave it raw. Ok let’s be real, I was simply too lazy to take the time and cook it. 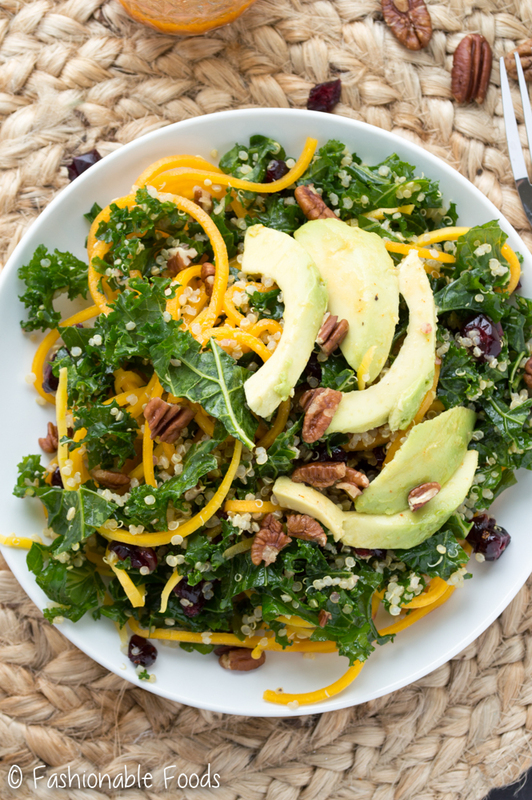 If you’ve never tried butternut squash raw in a salad I think you’ll be pleasantly surprised! Spiralizing it makes it fun to eat and once it marinates in the dressing, it tenderizes a bit. If you want it to be softer you can definitely give it a quick sauté, roast, or steam. The addition of quinoa adds some protein, the cranberries and sweetness, and the pecans add crunch. The avocado adds a nice creaminess, but is totally optional. Such a good combo of ingredients! The best part of this salad is the sriracha vinaigrette. SO GOOD. Easy too! I’m a big fan of making dressings in a mason jar – just dump everything in, tighten the lid, and get shaking. The orange juice adds sweetness, the vinegar adds tanginess, and the sriracha gives the salad a nice kick. I served this salad with grilled pork chops and it was a killer meal. Kyle wouldn’t even try the salad, but covered his pork chop in the sriracha dressing. I piled my plate with the salad and loved every single bite! 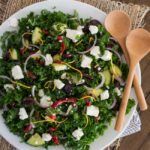 This recipe makes a nice big bowl of salad, so you’ll have plenty to take for lunches or for a dinner side all week long. It only seems to get better as it sits in the fridge, which is unusual for a salad! I also recommend doubling the dressing as you’ll want to put it on everything ?. 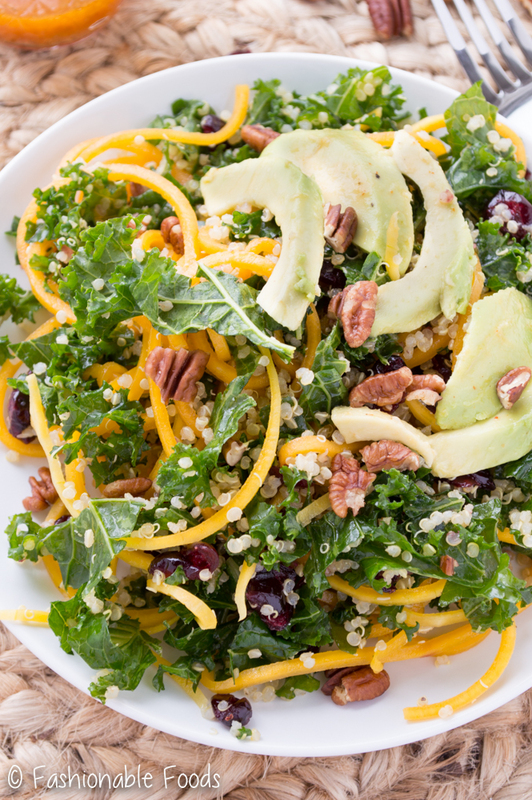 Tired of boring salads day after day? 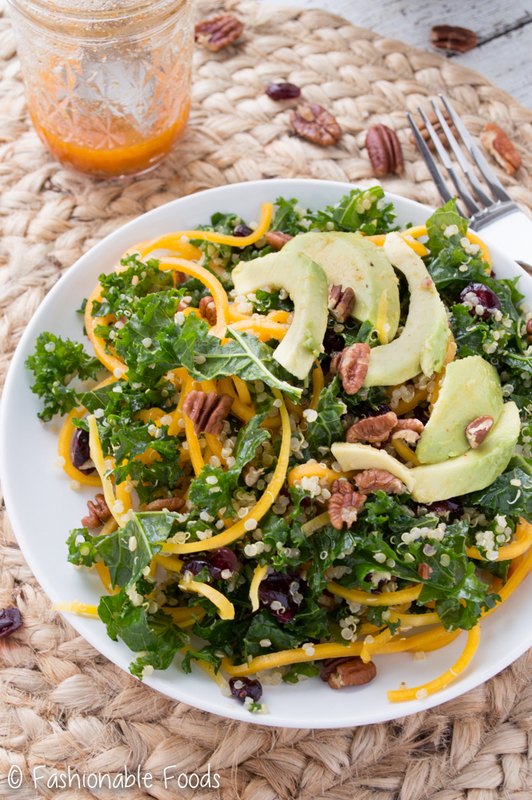 Try this spiralized butternut squash, kale, and quinoa salad! It’s full of color and flavor and can be made ahead and enjoyed all week long! Heat the teaspoon of olive oil over high heat in a medium-sized pot. Add the quinoa and sauté until any remaining liquid evaporates. Then, add in ¾ cup of water and bring to a boil. Reduce the heat to low and allow the quinoa to simmer for 10-15 minutes, or until the liquid has been absorbed. Remove the quinoa from the heat and let stand for 10 minutes. Fluff with a fork and transfer to a bowl to let cool completely. Make the dressing by combining the orange juice, sriracha, vinegar, salt, pepper, and olive oil in a small mason jar. Shake until well combined. 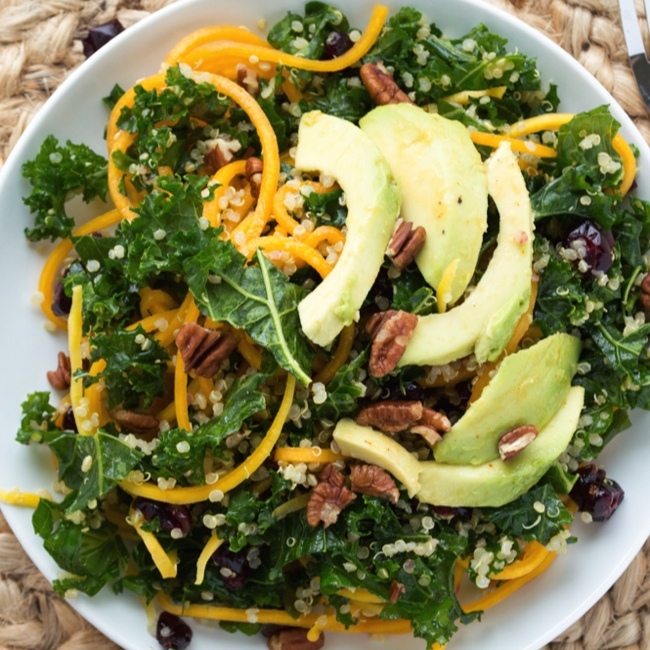 In a large bowl combine the spiralized butternut squash, massaged kale, and cooled quinoa. Pour half of the dressing overtop and toss well to combine. Let the salad sit for 30 minutes at room temperature to marinate with the dressing. When you’re ready to serve, top the salad with the cranberries, pecans, and sliced avocado. Serve with the remaining dressing drizzle over top. *Massage the kale by grabbing handfuls and squeezing until it wilts slightly and the color changes to a deeper green. I didn’t play the lottery, so I’m right there with you in not winning. 😉 But cheers up! I’m pretty sure anyone who wins that much money will be cursed with bad luck for the rest of their life. Anyways, this salad is totally my jam! LOVING the squash noodles in here!! 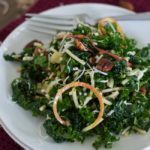 I am definitely adding this one to my salad rotation! Pinned! Cheers, doll! Yeah I’ve heard some horror stories of people who’ve won lottery jackpots – money can do some scary things to people! 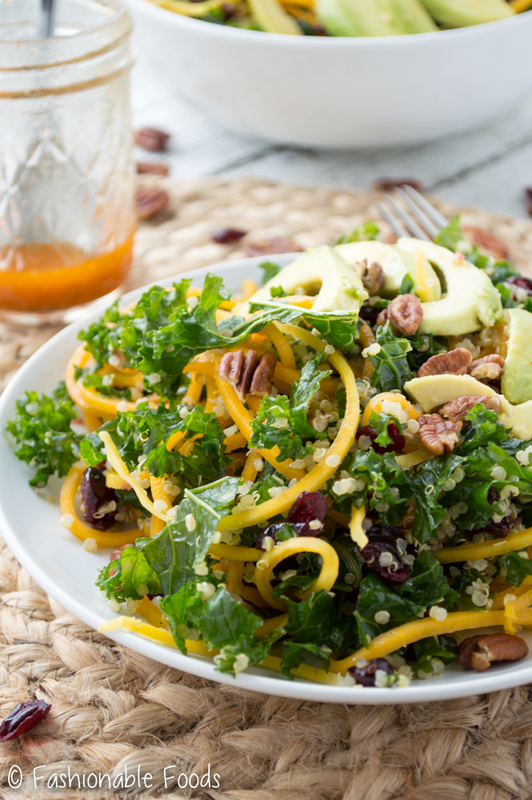 I’m obsessed with squash noodles – they make such a fun salad! Thanks, Cheyanne! I never play the lottery either, but I just couldn’t pass up buying a ticket. This is such a pretty salad, Keri! 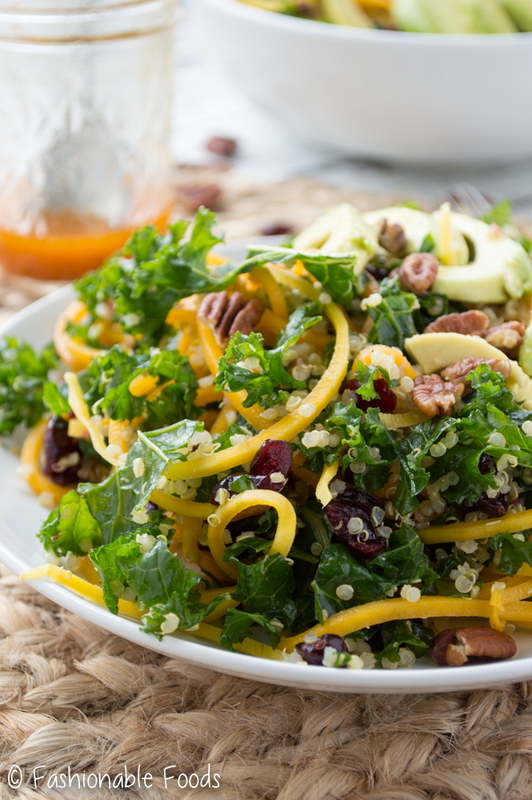 I’ve never thought to spiralize squash before, so I’m loving this! What a great way to keep my healthy goals on track for the year. And that dressing sounds so good! I love the sriracha in there! Do you saute the squash or put it in raw? Hi Loreta! I put it in raw, but if you prefer it cooked, you definitely sauté it first!